Online Help . . . Please select from one of the following options for help information. 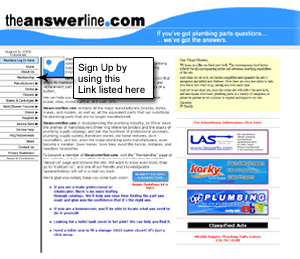 The purpose of this site is to deliver you the current information on all plumbing specialty parts for repair, restoration and installation purposes. As a public user, you will be able to view the categories and basic product information by using the navigation to the left hand side of the page. For more information about The Answer Line, LLC., please visit our About Us page. To request any additional information about our site, company, or products listed, please visit our Contact Us page to submit your request. 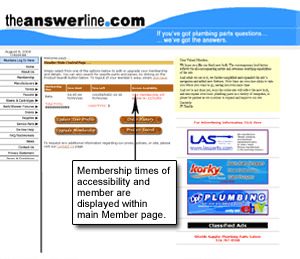 This site is based on a membership subscription in order to have full access to all of the information listed within the site. Obtaining a membership will allow you to search and view specific parts and products, their specifications, and even the printing of part sheets. It will also allow you to request an order for parts and/or products within the site. We provide a listing of manufacturers that we support to help you find the right part for your plumbing needs. If you are in need of a matching toilet seat, tank cover or fixture, we provide color guides with years of production and catalog images. Signing Up for a membership is easy and quick. Simple click on any of the buttons that indicate to sign up now, or you may use the links in the navigation as shown below. 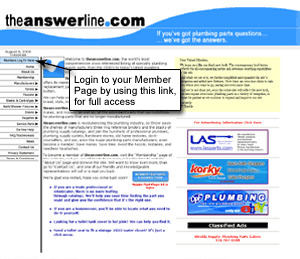 You can update your membership description at any time, through your Member Main page, by visiting the Upgrade Your Profile button listed on that page. Your member area will also allow you to edit your profile, change your billing information, along with your access availablity to the information listed within the site. If you have any questions or concerns, please do not hesitate to contact us.